Homily for the feast of the New Martyrs and Confessors of Russia. Today is a festive day for us, dear brethren; today we commemorate the New Martyrs and Confessors of Russia. How is this day significant for us - not only those of us who are Russian, but all Orthodox Christians, - and what concrete meaning does it have in our contemporary life? Almost 2,000 years ago, when our Lord Jesus Christ founded His Church on earth, and the holy apostles carried the teaching of Christianity to all corners of the then-known world, for the first three centuries Christianity was subjected to a most cruel persecution, which resulted in a great assembly of confessors and martyrs for Christ. The Lord allowed such a situation to occur expressly. With their blood the holy martyrs irrigated the earth, and became the good seed from which grew the mighty Church of Christ, which the powers of evil are unable to overcome despite all their best efforts throughout the course of 2,000 years. From the blood of the martyrs sprang the other categories of saints: the Holy Fathers, the hierarchs, the righteous ones, the venerable ascetics, the unmercenaries, the fools-for-Christ, and all holy men, women and children. The Church of Christ was supported by the spiritual feat of the first martyrs for 19 centuries. But then came the 20th century - the century in which, according to the Revelation, the world was to be given into Satan’s power, in order to prepare this world for the coming of the Antichrist. This period of time became the time of apostasy, which means - renunciation or abandonment of faith. From the very beginning of the 20th century, as a result of deliberately engineered political upheavals, such as: the Russian revolution, the First World War, the abolition of monarchies, the seizure of many countries by the godless Communist rule, - the entire world was turned upside down and all human values were distorted. Apostasy rushed like a mighty stream along all aspects of human life: there occurred an abandonment of God, an abandonment of morality, an abandonment of beauty, a complete disfigurement not only of man’s external appearance, but of all the manifestations of the human spirit. Satan truly took power over mankind. But in these terrible times the Lord did not abandon His Church and His faithful followers. Having meted out to mankind what it deserved for abandoning God, the Lord simultaneously sent us a wondrous support: a new and extraordinary assembly of confessors and martyrs for Christ. The New Martyrs of Russia. These new martyrs appeared in all Orthodox and simply Christian nations. Their number was so great that, as the Revelation says, the angels could barely cope with taking care of the souls of the martyrs as they passed into the other world. We venerate the New Martyrs of Russia because they were the first to be martyred, and thus they showed a wonderful example to all other nations, and also to us. In the beginning of last century, the Russian Empire was the bastion of Orthodoxy in the entire world, and for this reason it became the primary object upon which Satan vent his rage through his earthly servants. The Russian Church, however, did not shame our Lord Jesus Christ, but exhibited its loyalty to Him and answered Him with a great multitude of new martyrs. Martyrdom is the greatest of all forms of holiness, because it consists of a most difficult feat: the giving up of one’s body to cruel tortures and the giving up of one’s life for God and one’s neighbors. The time of apostasy continues up to this very day. Gazing around us, we can see how the world truly lies in iniquity, and how sin has spread over the world more than in Sodom and Gomorrah, more than before the deluge. Everything in the world is ready for the coming of the Antichrist. But the Lord still shows great patience with us, still shows His mercy to us, still refrains from sending us that “man of iniquity,” because with his appearance in the world time will be shortened and there will be no more salvation. We still have the opportunity to come to church, we still have the opportunity to receive the grace of the Holy Spirit through the sacraments, we still have the opportunity to live a Christian life and try to attain salvation. But will we have this opportunity for long? 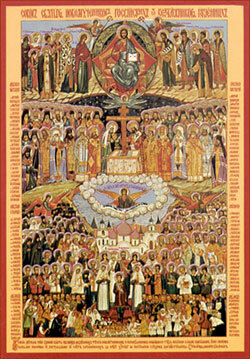 No one knows when the end of time will come, but right now, being already on the threshold of the coming of the Antichrist, we must turn to our great mentors - the New Martyrs and Confessors of Russia, who are a concrete and quite contemporary example of what Orthodox Christians must do and how they should live within the terrible framework of apostasy. O, holy New Martyrs and Confessors of Russia, pray to God for us, that we, too, when the hour of trial comes upon us, remain faithful to our Lord Jesus Christ! Amen.